How do we ensure that all students are engaged each day in meaningful, challenging, and joyful work and have equal opportunity to learn? That is the central question Regie Routman addresses in Literacy Essentials: Engagement, Excellence, and Equity for All Learners. Her response is that such an outcome is only possible within a culture of empowerment in which all students and teachers feel encouraged and supported to let their voices be heard, explore their passions and interests, develop deep knowledge, and become their fullest and truest selves. Includes a free Study Guide and free College Course Curriculum. Rich online resources including a comprehensive lesson plan, an easy-to-use study guide, downloadable Appendices, and more. Literacy Essentials shows what’s possible when teachers and schools raise expectations for all students and create an intellectual culture based on trust, collaborative expertise, and celebration of learners’ strengths. Listen to a 30-minute podcast of Angela Watson and Regie Routman discussing Literacy Essentials. Listen to Essential Conversations with Regie Routman and Allison Tucker, a special series from voicEd Radio facilitated by radio broadcaster and educator Stephen Hurley. What stands out most to me in Literacy Essentials is Routman’s honesty and her willingness to help teachers think about how to balance joy, high expectations, and student accountability...It's as close to perfect a tool as I’ve seen to use as part of ongoing professional development for literacy practitioners and leaders. "Never underestimate that you—one deeply, caring, knowledgeable, curious educator—can make a life changing difference in a child’s life." Learn why and how this is the book for today’s times—for creating a trusting, collaborative, joyful school culture where all learners thrive. Regie Routman is a longtime teacher, leader, and author who is committed to improving the literacy and learning lives of students, especially those in high-challenge schools. She currently works on-site in diverse schools and districts coaching and mentoring principals, leaders at all levels, and teachers. Regie Routman has done something special with this work, and I can't recommend it enough. As a middle school Literacy Coach, educator, and impassioned believer in our schools, this is one of the few books I can say need to be in every school. It's wrong to say this is just another book about literacy…The real meat of this work, and the reason I hold it as one of the most important books written this decade, is how the work addresses equity. Literacy Essentials is one of the most important books of the decade, and you owe it to yourself to buy this phenomenal work for yourself, your team, and you're campus. 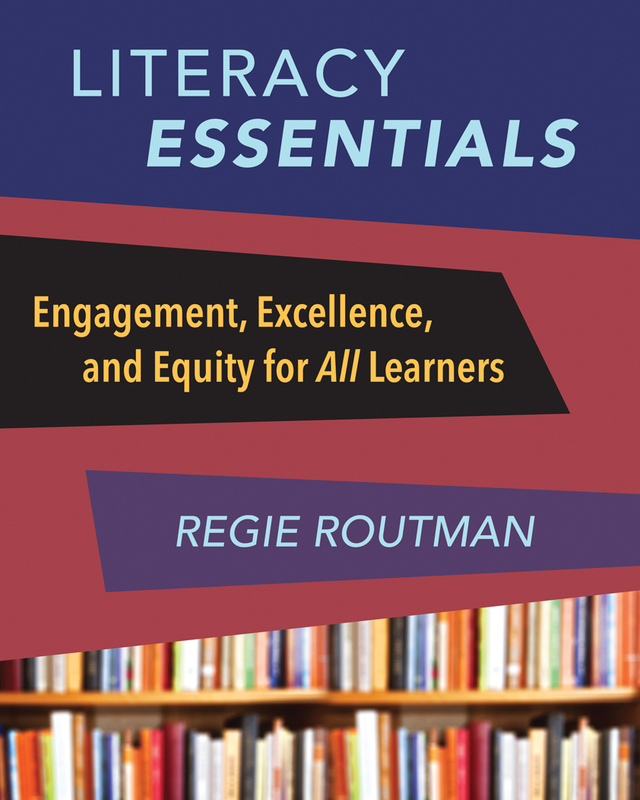 Sometimes I read a book that just makes my heart pound with joy...as far as I'm concerned, every single teacher and administrator needs Regie Routman's new book, Literacy Essentials: Engagement, Excellence, and Equity for All Learners. It's refreshing to see a specific game plan rather than ideology... The result is a concrete plan for literacy that can be used in a wide range of classrooms and student proficiency levels. Like having coffee with a master teacher...every page of this book inspires us to action. I had to stop dog-earing because the page corners were running into each other. This is a MUST read for any future or current educator who believes in all students, who values intellectual collaboration, and who wants to be part of a culture that celebrates the teaching and learning relationship. I have been carrying your latest book around and reading and rereading parts. I am using it to bring out reading ability in my special ed students, and let me tell you, it's like a miracle. I'm trying to figure out how to get the opportunity to show teachers that they can plug what is going on with our reading work, into their content classes.